One of the finest Italian wine events is returning soon to New York City, Chicago and Washington, D.C. 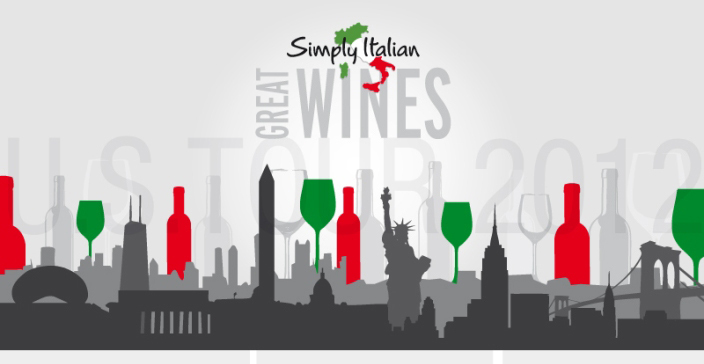 It will be held in those cities on October 15, 17 and 18, respectively and if you're an Italian wine lover living in or near those cities, you need to be there for an unparalleled day of Italian wine tasting and education. I've been involved in moderating a seminar for this event for the past three years and I'm excited about the seminar on the wines of Collio I'll be leading in Chicago. There will also be a seminar on the wines of the Veneto that day in Chicago, as well as a seminar on Federdoc, the agency that oversees DOC, DOCG and DOP regulations; things are changing rapidly with these designations and this seminar, taught by Riccardo Ricci Curbastro, will be of invaluable assistance to anyone who wants to better understand today's Italian wine. That same seminar will also be offered in New York City along with a special presentation on "The Legends of Italian Wine," featuring such Italian wine producers as Masi, Pio Cesare, Antinori, Argiolas, Mastroberardino and Michele Chiarlo along with another five great producers; Gloria Maroti Frazee of the Wine Spectator will moderate this seminar. 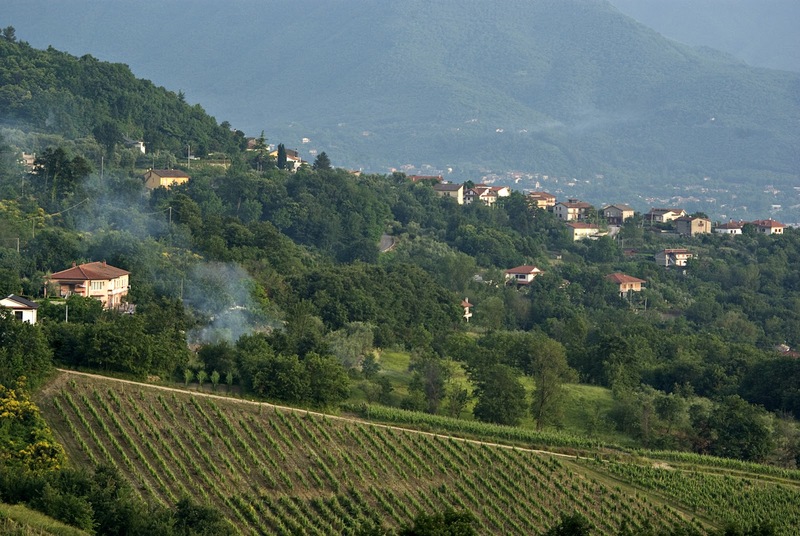 After this, the seminars on Collio and Veneto will be offered. There will be a gala tasting of hundreds of the finest Italian wine estates from the breadth and width of the country that will be held in the afternoon at all three cities. Information on the Simply Italian events can be found here. Please note that seating at each seminar is limited and you must register to assure your spot. To do so, contact Jessica Celona at 305-937-2488 or info@ieem.usa. Looking forward to seeing you at Simply Italian in mid-October! My next Italian wine dinner will take a look at how Italian wines - white, red and dessert - age. We will taste current and older vintages of some very special Italian wines, which will be paired with the excellent cuisine of Chef Robert Reynaud at Vivere at The Italian Village in Chicago. 2009 Pieropan Soave Classico "La Rocca"
2004 Pieropan Soave Classico "La Rocca"
2007 Masi Amarone Classico "Costasera"
The price for this dinner will be $130 per person, which includes tax and gratuity. Considering that the cost of the Le Chiuse Brunello Riserva is approximately the same price for one bottle, the total charge for this dinner is quite reasonable. Please note that this dinner will be at a single table in Vivere and will be limited to ten people. Thus it is important that you need to contact me as soon as possible to reserve your seat, as this will no doubt fill up very quickly. If you are interested in attending, contact me, Tom Hyland, by email at thomas2022@comcast.net and I will let you know about payment options. You will be required to pay me before the dinner to reserve your seat. Please do not contact Vivere or The Italian Village - you need to contact me. I look forward to seeing you at this special dinner, one we will all remember for quite some time, as we celebrate the best in Italian food and wine over the past twenty plus years! Not too many years ago, dozens - perhaps hundreds - of daily newspapers across America featured a wine column. Most papers hired a writer to compose a column that would inform the public about the latest trends in wine or perhaps offer a few suggestions about what wines would be perfect for an upcoming holiday meal. Some papers with large circulations even hired freelancers to write an occasional piece that would give readers a different take on their primary wine writer's viewpoint. I know this for a fact, because for a little more than seven years, I was a freelance wine writer for the Chicago Tribune. It was at the time a highlight in my career and I still think of it that way. Well, what a difference a few years make! Today of course, dozens of newspapers in America have folded. Others that have survived the digital age have had to tighten their belts in order to stay in business. That meant that the "fat" was trimmed and for most of these print publications, the reality was that the wine column - or at least their own wine columnist - had to go. Thankfully, a few papers still do have an original wine (and spirits) column and a few even feature exceptional writing. You'd be hard pressed to find a better wine writer in America today than Eric Asimov at The New York Times, but given the Times' track record with wine writing, maybe that shouldn't come as a surprise. For forty years, this paper has been the one that tens and hundreds of thousands of wine lovers have turned to for the latest on the world of wine. That Asimov's work is still widely read today amidst the vast wasteland of wine blogs and online articles speaks well not only to his talent, but also the journalistic standards of his employer. 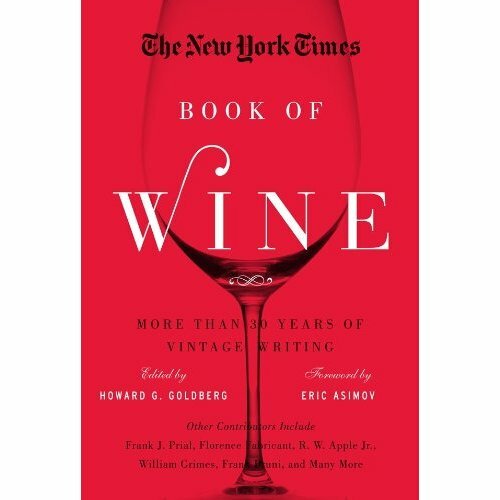 So it is with great excitement that we can now enjoy a brief history of some of America's best wine writing in the just-published The New York Times Book of Wine: More than Thirty Years of Vintage Wine Writing (Sterling Epicure, New York, NY; 592 pages, $24.95). This is a book that anyone - beginner or thirty-year wine lover - should study. For me, reading just a few of these articles felt like sitting by the fireside with a comfortable sweater on a cold winter's night - this has that same relaxed feel. But of course, reading this book is a great deal more stimulating! We get a total of 125 articles from 29 different authors; the articles take us around the world of wine, from California to continental Europe and South America; there are also pieces about wine hardware (the first article in the book is a clever piece by Eric Asimov entitled "The $410 Corkscrew"), the language of describing wines and of course, some excellent articles about pairing wine with food. What I love about the book is the tone taken by the writers, all of whom are well versed in wine, yet never take themselves too seriously. There are some marvelous pieces by Frank Prial, the paper's first regularly featured wine writer, about winespeak. In one column, he writes about the need by some people to describe a just-opened bottle and how impossible it is to avoid that individual's ramblings ("the stuff is inescapable, it's right there on the table in front of you..."). In a companion piece, he writes of an imaginary cliché expert who talks of how winemakers "craft" wines and how full-bodied wines are described as "mammoth" and "be-hemoths." Other writes are featured with their take on the specific language of wine. While there is technical information in the book, that largely remains in the background, as the writers constantly keep things engaging. Read the pieces by the late R.W. (Johnny) Apple, one of the paper's most beloved writers; he paints pictures of the places he visits as well as the people he meets. His articles about Nicolas Catena of Argentina and two partners that became remarkably successful in Puglia a few years back are beautifully written and charming. Reading these, one doesn't think of points or high ratings in a wine publication, but rather, the unique qualities of these individuals. In today's world of instant recognition where a wine's acceptance is too often based on a sound bite, this quality of wine writing is sorely missing. There are several short pieces by Florence Fabricant, who devises food pairings for the wines written about in any particular week. These are nicely organized and as an added bonus, also feature the recipes. One of her pieces deals with choosing just the right wine for the bitterness of radicchio in a dish. It's probably not something many of us think about too often; her thoughts on the subject are quite valuable. What a nice touch by editor Howard Goldberg (who wrote about wine for the paper in the 1980s) to include these brief articles! 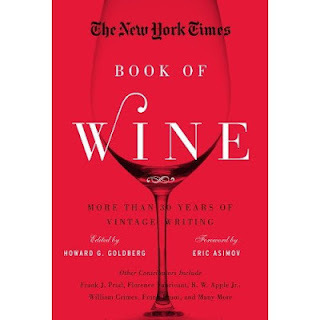 Earlier, I mentioned that I thought Eric Asimov is the best wine writer in America today; there is sufficient evidence in this book to support my claim. What I admire about Asimov is that he writes not only with great knowledge, but he tends to use a matter-of-fact approach. He can discuss the most famous, most in-demand wines of the world and talk about them without fawning over them. In his job, he is invited to some pretty dazzling affairs, yet he never treats them as monumental tastings or moments that changed his life. This approach helps the average reader - whether wine novice or professional - connect with Asimov, as his common sense attitude helps everyone better understand that we are, in the final analysis, merely discussing a bottle of wine. Personally, I love Asimov's work as he is a lover of traditional wines; the super ripe, international style favored by a few influential wine publications, is not a quality the author seeks out. This is evident in several articles in the book, most noticeably in a piece entitled "Finessed and Light: California Pinot Noirs with a Manifesto." The subject of this article from 2009 is about several winemakers who were (and are still) making Pinot Noirs that reflect lower alcohols, are aged for a shorter time in wood and display finesse; this approach a 180-degree turn from some of the most highly decorated examples of this variety in California. "Food and wine's role at the table is seemingly what divides these stylistic camps," Asimov writes. He goes on to ask if wine is meant to be a partner with food or if it should be enjoyed on its own; Asimov includes quotes from some of these producers on this topic as well. It's a brilliant summary of an important subject in today's wine world, not just regarding California Pinot Noir, but any number of wines from various parts of the globe. What is the real role of wine? As with any good writer, Asimov admits his outlook may not be what another person believes. It's not a question of right and wrong, as one person may love a particular wine that someone else passes on. But how nice that Asimov can clearly think for himself and take this approach. After reading this article, you wonder if a wine journalist living in California would have had the honesty to write a similar piece. There are all sorts of people today who call themselves "wine writers." No need to dwell on this subject - enough said. So especially for these individuals, but in reality, for everyone that wants to learn more about the wines and spirits of the world and recall what excellence in wine writing was all about - and still is in small doses these days - I strongly recommend purchasing a copy of The New York Times Book of Wine. For me, this is one of the most important wine books of the last thirty years - it's that good. P.S. I've only read a couple dozen of the articles in the book so far. I'm going to take my time, because like a great bottle of wine - I don't want it to end!